Sophie Cavaliero, photo by Thierry Decoster. 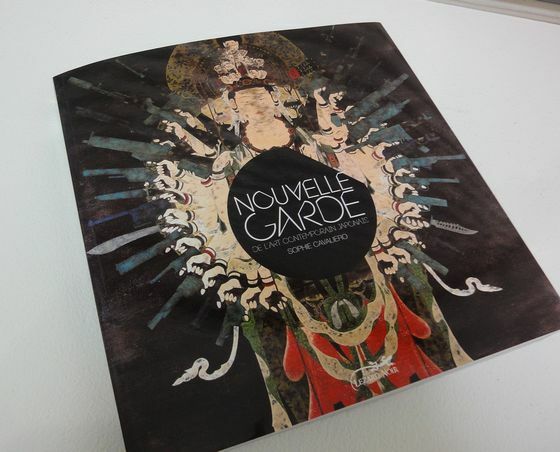 I was glad to know when Sophie Cavaliero who is one of the Azito’s collectors, told me that she has published the book titled “Nouvelle Garde” last year. It is a book about the new generation in Japanese contemporary art after Takashi Murakami, including many artwork images all in color with bilingual texts (French and English). I interviewed her over skype from Tokyo to Paris, asking why she started to work on this book and how things went during the process. It was impressive to know the idea of the book was based on her experience and her passion moved many people. Absorbed in manga and litrature, Japan was a fantasy to me. -How does you interest in Japan begin? My first experience with Japan is that I was reading manga since I was five. I started with Osamu Tezuka “Princess Knight”. At that time, manga was completely unknown in France and even finding them was difficult. The second experience is that I was an avid reader and I read books by Yukio Mishima when I was like 16 or 17. And since then, I started to read a lot of Japanese literature. So I had image of Japan as a fantasy, it must be reality but not real to me. And through these experiences I was really captured by Japan. -You said, “Japan is strange and intimate” in the book. What does it mean and did it change when you actually visited Japan? What I meant about “strange” is something difficult to understand, such as a culture to eat raw fish for example. Of course sushi became popular all over the world recently but more than ten years ago, it wasn’t. After visiting Japan, my perception did not really change. But in fact, I found that I like Japan more! Hahaha. For French people, Japan is like fantasia; dream, far from our reality. As I visit Japan enjoying the food talking with people and becoming friends, it became a more realistic world to me. -Could you tell us about when you first saw Japanese contemporary art? Murakami held an exhibition at the Foundation Cartier (2002) and I visited there with my son. My son really liked the exhibition, so do I and we bought a catalogue of the exhibition. Since I read a lot of manga in my childhood his motifs were familiar to me and it was something I could have not seen in France. Since then I started to get information about Japanese contemporary art. -I am impressed that the book includes plenty of artwork images with succinct description. Have you been working for art industry? I have been working as human resources staff manager since I graduated from business school. So I have not done anything in art for these 20 years. I loved art but it is difficult to decide whether I really want to work for it, to keep it more as a passion. And 4 years ago, I took a one-year break and studied art, visiting galleries and so on. I had passion toward art but still I felt difficult to do it as a job. So after the one-year break, I went back to my company. -Then, how did you come up with the idea of writing about this book? Although I went back, the company closed and I saw it as an opportunity to do something else and to do something on art. I knew that I would be a bad gallery manager, (hahaha), and honestly did not know what to do first. I started to collect Japanese art 5 years ago. Since I want to know everything, I collected all information and asked many questions. When I talked with my teacher at the art school during my one-year break about how I collected the all information of Japanese art, it came naturally the idea of writing a book in French on the subject to make it easier for other people to discover this art. Hearing my story, she said, “Why don’t you give a challenge, Sophie!” It was like a joke at that time but it became realistic as I thought I should do it after quitting my job. -When did it become more realistic? I became even more serious thanks to the artists Akino Kondoh. When I talked about my plan during her residence in NY she introduced me to Stéphane Duval, the director of the publishing company Le Lézard Noir. In fact it was the publisher I had in mind so it was a good coincidence and I was lucky. And the meantime, I met Mr. Koyama (Tomio Koyama Gallery) at Art Basel and talked about my plan to him and then they introduced me Yumi Yamaguchi, who writes the forewords of my book, she was really nice to do so, and other key people. They were all really supportive and I could not have done it without them. Mr. Mizuma (Mizuma Art), who I met in Japan, really helps very much supported by his team. I really learn with them. -Partnership between you and the galleries/artists looks really tight. 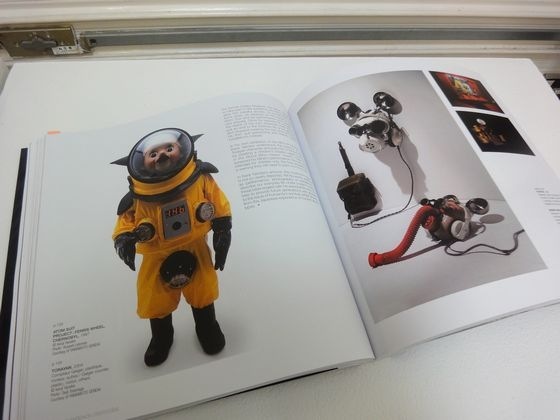 And that is why the gallery and the artist reviewed all the texts in the book. I first wrote the text with what I see and what I understood. However, I wanted the text to be a voice of the artwork and not only of my voice. We really worked back and forth, hours and hours, maybe exchanging more than thousands of emails?! But it was also good for me since it also meant that this book was really accepted by them. -They must be moved by your passion to introduce Japanese contemporary art worldwide. Yeah, and I think it went nicely also because I purely wanted to introduce about Japanese contemporary art and not doing a business on it. I wasn’t keen on one particular artist and they understood my book would really help to promote them. When they come to France, I tried to introduce them to galleries and art people without doing any business on it to keep it as a passion and not get confused. I bought artworks with my limited budget and all of these may have helped me to create the trust between us. -You listed 350 artists and chose 50 among them. How did you choose them? I chose the artists basically whom I like and also tried to list the representative selection of Japanese contemporary. Some people say why I did not include this artist or that artist, you know, it very difficult to say but I prioritized my preferences, as I wanted to write how exciting their works are. Also there were some artists who did not want to be listed in my book although I liked their works a lot. The main reason was they did not want to be categorized as a “Japanese artist”. It was a sad answer but at the same time I understand what they meant. It was not my main purpose to categorize them with nationality but I wanted to put them in one book since Japan is the country, which brought many excitements to me. -How did you divide the section in the book? I think it was really difficult to grouping works. First I thought of doing it with alphabetical order of the artists name but I found it is boring. So I started to think what the major subjects I could see in the artworks is. The book “Art contemporain japonais : une quête d’identité” by Charlène Veillon help me a lot. It also gave me a lot of inspiration for me. She stated about the Murakami’s success and my book is about the generation after the Murakami. Since I wrote this book is not for the art people, I thought dividing the section with the subjects in the work would be more familiar for them to begin and discovered art. 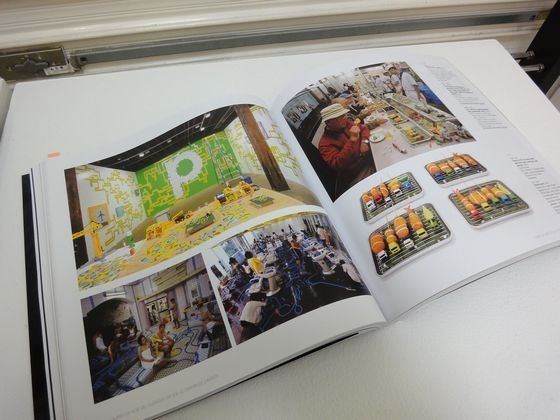 This book is a guide to enter the world on Japanese contemporary art. -Why did you mainly focus on the artists after the Murakami’s generation? Murakami’s success was good and also bad for Japan. Because of him, people paid attention to Japanese art more than ever but at the same time, they were waiting an artwork, which is similar to his work. For me, it was a frustration, because Japanese art is not only about Murakami. I love his work and understand that he is really important in the Japanese art world. However, I felt it is reductive to expect only similar works. And this was another motivation for me to work on this book. 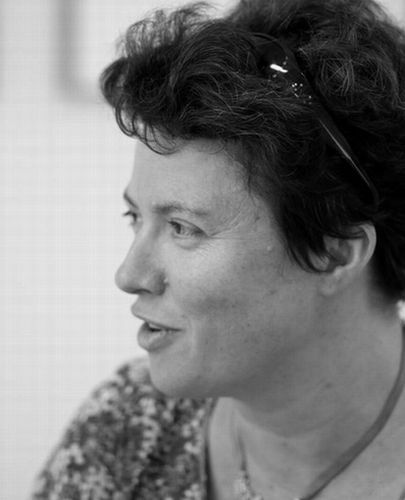 -How do you see your book and who you want it to be read by? I would rather say it is not a book to see the stream of Japanese art history but a guide to enter the world on Japanese contemporary art. This book is not for the art people but for the people, who like art but not familiar with it, just like me 5 years ago. Through working on the next book, I felt Japan is trying to change. -As I heard that you are working on another book of Japanese photography, could you tell us about it? I am a big fan of Tomoko Sawada, Rinko Kawauchi, Miwa Yanagi and so many other Japanese photographers and simply wanted to talk more about that in another book. Some French collectors also told me, they have missed some Japanese photographers and are willing to catch up. As Paris Photo is the major photo art fair held here (plus numerous Photography festivals and the well-known Photography event – Les Reencounters darkles), there are lots of interests in photography, here in France. In fact, I am back to do my human resource stuff as a professional job; I decided to create a team to work on this book with me. This team is composed by Thierry Decoster, who is an expert on Japanese photography books, also running a bookstore in the north of France; Valérie Douniaux, who is an art historian, specialized on Japan and Michela Scotti, who is an art advisor on contemporary Japanese art and photography in Italy and writes on art for magazines. This time will be including a dozen of interviews with the photographers. We met around 40 photographers during our trip to Japan. We are planning to publish it at the time when Paris Photo is held next year, fall 2013, with a snapshot presentation at the event “Les Rencontres d’Arles ? June 2013 with the help of distributor. Since photograph captures the real world, we talked with artists about what is going on in Japan a lot, for example in Fukushima. Drawings and other media may be able to have a distance between the work and the real world but photographs are more directly connected. Through talking with them, I could really feel that the country is suffering and trying to change. The need of change is really required among the country. Art makes me think of what is going on in the society and how we can work on it. -What is art for you? Art really makes me think of what is going on in the society and how we can work on it. Its expression may be a little bit extreme than reality but this madness takes us to deep thoughts. Especially, I work for human resource and human being is all about that.